This heavy-weight measures 18" clasp to clasp with another 1 1/2" from the center dangle. It is a bold piece that is sure to get some attention. There is a ton of sparkle from the center black rectangle beads - which are fully faceted - that the camera did not pick up. 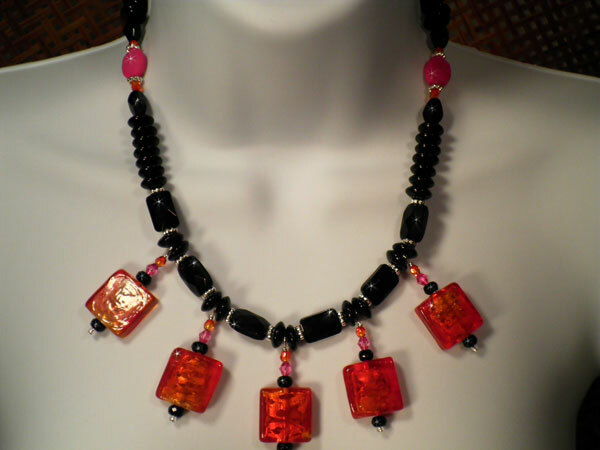 The same is true for the small black disc beads that surround each orange glass square. I've also used large black saucers, orange faceted acrylic ovals, pink acrylic bicones, pink faceted ovals, silver seeds and silver spacers. Have fun with this one and prepare to be noticed!